Learn more about the pathological links between Alzheimer’s and diabetes, and how understanding more about them could lead to effective therapies for both. Join Cure Alzheimer’s Fund Research Consortium member Sam Gandy, M.D., Ph.D., and David Shenk, author of the national bestseller, The Forgetting, for a free webinar about the linkage between Alzheimer’s disease and diabetes. Alzheimer’s disease and Type II diabetes have been observed to have a clinical connection. Patients with diabetes are more than twice as likely to develop Alzheimer’s, as those without diabetes. The precise nature of this connection has been a mystery until recently. Over the last few years, research projects funded by Cure Alzheimer’s Fund and others have helped bring us much closer to an understanding of the molecular connection—and, potentially, to effective treatments for both Alzheimer's and diabetes. Sam Gandy, MD, PhD, is Mount Sinai Professor of Alzheimer's Disease Research, Professor of Neurology and Psychiatry, Associate Director of the Mount Sinai Alzheimer's Disease Research Center in New York City, and Chairman Emeritus of the National Medical and Scientific Advisory Council of the Alzheimer's Association. Dr. Gandy is an international expert in the metabolism of the sticky substance called amyloid that clogs the brain in patients with Alzheimer's. In 1989, Gandy and his team discovered the first drugs that could lower formation of amyloid. 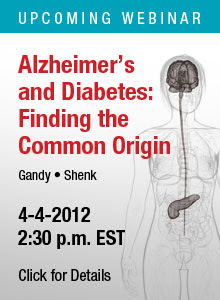 Dr. Gandy has written more than 150 original papers, chapters and reviews on this topic. Dr. Gandy has received continuous NIH funding for his research on amyloid metabolism since 1986. David Shenk is the award-winning and national-bestselling author of six books, including The Genius in All of Us ("deeply interesting and important" - New York Times), The Forgetting ("remarkable" - Los Angeles Times), Data Smog ("indispensable" - New York Times), and The Immortal Game ("superb" - Wall Street Journal). He is a popular lecturer, a short-film director, and a correspondent for TheAtlantic.com. He has contributed to National Geographic, Slate, The New York Times, The Wall Street Journal, Gourmet, Harper's, Spy, The New Yorker, NPR, and PBS. Shenk lives in Brooklyn.